Eeeeeeeeeeeeek!!! Critters, critters everywhere! Lads, hand o’er me pistol and be on the lookout at the scuppers! The rats be having their dance with ol’ Jack Ketch! While me hands be swabbing the poop deck, allow me to splice the mainbrace and tell ye about an app called Rodent’s Revenge. In this game, the damn critters have their day! During the earlier days of gaming, it wasn’t all about which ones had the best graphics and provided the most immense storyline for games to become engaging. A lot of the titles which were released some 20 years ago had one thing going for them, which is the fun factor. 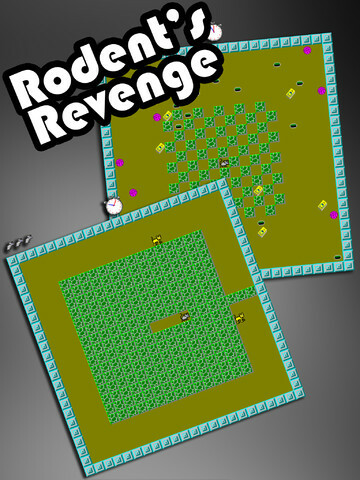 One of those games is Rodent’s Revenge, which was released in 1991 for Windows users. Now, whether you have played this game during your childhood or new to it, you can enjoy Rodent’s Revenge for your iOS device. For those who have not had the pleasure of playing Rodent’s Revenge when it first came out, you are in for an absolute treat. Forget about fancy graphics and complicated game play, this app will surely give you thrills every time you play it. The premise of the entire thing is that your character is a mouse in an environment riddled with cats, traps and holes. Then, the point of the game is to eliminate the cats by moving around the blocks so that you can trap them in. At the same time, you need to avoid being caught by these feline creatures and of course avoid falling into other traps as well. In order to trap the cats, move the blocks by tapping the screen and bumping the mouse in a particular direction. Then, take the best opportunity and wait for the cat to move in to your own trap to trap it. 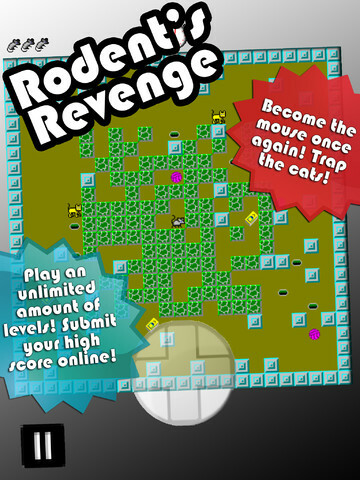 Once you eliminate all the cats in a particular level, you will be able to move onto the next one. Another feature with this game is that you will be able to choose the speed in which you can play in. You can start off slow to begin with or move to an advanced speed if you are already quite familiar with it. Once you play Rodent’s Revenge, it starts off pretty easy. This is so you can get the hang of how the game works and for you to familiarize yourself with the game play. However, as you move from one level to another, things will get pretty rough. Sooner rather than later, there will be more cats and traps will start appearing all over the screen. This game will become a test of how quick your wit is and how well you adapt to situations. While Rodent’s Revenge may certainly not be much to look at, it surely makes up for it with its playability and sheer awesomeness. Since it is re-launched and redesigned for the iOS, the appearance has improved in such a way that the game supports retina display. This simply means that the screen does not look fuzzy or grainy as compared to the original version of Rodent’s Revenge. So if you want to have a combination of fun and excitement, this game is well worth the download.